First of those on a clean score Montreal Diamonds had disappointment after Harrie Smolders’ Cas dropped a leg in the double to put the team on a score of 4, slower than the Knights despite a strong clear from Mark McAuley and Miebello. Prague Lions fielded U25 rider Anna Kellnerova first, and there was heartbreak as the final fence - the Monte-Carlo Casino vertical - fell. Another two from Gerco Schroder and Glock’s London saw the team plummet down the order and out of podium contention. Constant van Paesschen pulled out a phenomenal clear for the Rome Gladiators with the enthusiastic stallion Jilbert van ' T Ruytershof, managing his horse brilliantly to leave the team on a zero score. Anchor Marlon Zanotelli put in a breathtaking performance with Rock'n Roll Semilly, keeping the Gladiators as the only team on a completely clear score. 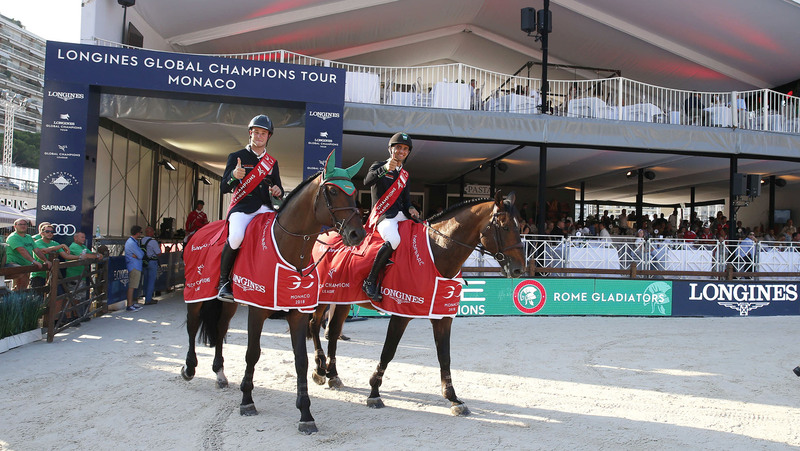 Jan Tops, GCL Co-Founder: “It was nice to have a new team pairing up - I think it was the first time [Marlon and Constant] rode together. The arenas are very diverse, which is what the GCL is all about - here we needed obedient horses with quick reactions, which is different from somewhere like Hamburg. That’s what makes the Championship so special. Monaco is not our biggest event in numbers, but we have many passionate fans, and lots of media. It has been one of the events from the beginning and we all love to be here." Harrie Smolders, Montreal Diamonds, 3rd place: “Mark and Miebello is a great combination, they are very consistent, already last year, and that is why also took them onto our team. I’m pleased with Cas - we did already many big classes - and he looked very consistent and a lot of clears." Ben Maher, London Knights, 2nd place: "I thought it was a difficult course today. It was hot at that time of the day and I always expected it to change around a bit today. There was many clears the first day and today, myself and Martin knew we had to get some clear rounds. Martin changed to a new horse and it jumped very well - which promising for the rest of the season that we have a extra horse on the team. We played the strategy - Martin couldn’t ride too fast. I went second and put the pressure on with a faster time and I think that gave us a little bit of edge today." "As Harrie says, there’s a big gap from the second to third right now but we’re very strong team - tightly knitted together, we talk a lot and have a good plan going forward so we just have to keep trying to continue to do our best and select the right horses for the right venues and hopefully we can continue as we have been." Marlon Zanotelli, Rome Gladiators, 1st place: “It was a big day for the Rome Gladiators and I’m very happy with my first podium for the Gladiators this season. I was under big pressure but it was a good pressure because Constant went first and jumped clear both times, and I knew what I had to do. I knew that we would not have the fastest of times so I concentrated on a clear round. Today was a much tougher course with a lot of faults and we were lucky that we managed to both jump clear rounds." Constant Van Paesschen, Rome Gladiators, 1st place: "Jilbert [van ' T Ruytershof] is enjoying jumping and because he is breeding a lot it makes him is very fresh at the moment but he did a great job today. It was a good feeling to be part of a winning team in Monaco. Over the coming weeks, I hope the boys will do a good job - my next event from the team is in Berlin and we’ll see what is going to happen!"